Nomadic cultures such as the Yuezhi (Rouzhi) are documented in the area of Xinjiang where the first known reference to the Yuezhi was made in 645 BC by the Chinese Guan Zhong in his work Guanzi (管子, Guanzi Essays: 73: 78: 80: 81). 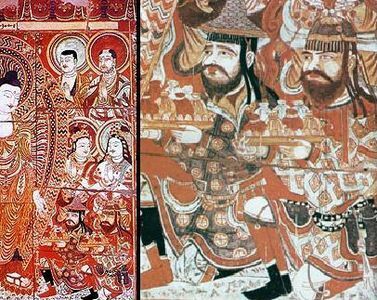 He described the Yúshì 禺氏 (or Niúshì 牛氏), as a people from the north-west who supplied jade to the Chinese from the nearby mountains (also known as Yushi) in Gansu. 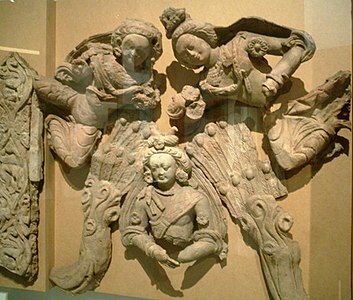 The supply of jade from the Tarim Basin from ancient times is well documented archaeologically: "It is well known that ancient Chinese rulers had a strong attachment to jade. All of the jade items excavated from the tomb of Fuhao of the Shang dynasty, more than 750 pieces, were from Khotan in modern Xinjiang. As early as the mid-first millennium BC, the Yuezhi engaged in the jade trade, of which the major consumers were the rulers of agricultural China." 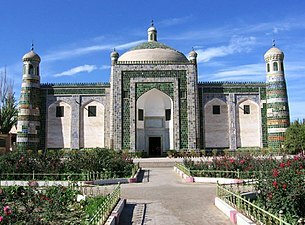 Han and Hui merchants were initially only allowed to trade in the Tarim Basin, while Han and Hui settlement in the Tarim Basin was banned, until the Muhammad Yusuf Khoja invasion, in 1830 when the Qing rewarded the merchants for fighting off Khoja by allowing them to settle down. Robert Michell stated that in 1870 there were many Chinese of all occupations living in Dzungaria and they were well settled in the area, while in Turkestan (Tarim Basin) there were only a few Chinese merchants and soldiers in several garrisons among the Muslim population. Xinjiang has within its borders, in the Dzoosotoyn Elisen Desert, the location in Eurasia that is furthest from the sea in any direction (a continental pole of inaccessibility): 46°16.8′N 86°40.2′E﻿ / ﻿46.2800°N 86.6700°E. It is at least 1,645 miles (2,647 km) (straight-line distance) from any coastline. In 1992, local geographers determined another point within Xinjiang – 43°40′52″N 87°19′52″E﻿ / ﻿43.68111°N 87.33111°E in the southwestern suburbs of Ürümqi, Ürümqi County – to be the "center point of Asia". 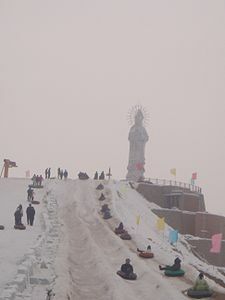 A monument to this effect was then erected there and the site has become a local tourist attraction. In 1995, there were 50 minority-language newspapers published in Xinjiang, including the Qapqal News, the world's only Xibe-language newspaper. The Xinjiang Economic Daily is considered one of China's most dynamic newspapers. ^ "National Data". Retrieved May 6, 2015. Uyghuristan) is a term with multiple meanings depending on context and usage. Historically, the term was invented by Russian Turkologists like Nikita Bichurin in the 19th century to replace the term Chinese Turkestan, which referred to the Tarim Basin in the southwestern part of Xinjiang province of the Qing dynasty. The medieval Persian toponym "Turkestan" and its derivatives were not used by the local population of the greater region, and China had its own name for an overlapping area since the Han Dynasty as Xiyu, with the parts controlled by China termed Xinjiang from the 18th century onward. The historical Uyghur name for the Tarim Basin is Altishahr, which means "six cities" in Uyghur. Starting in the 20th century, Uyghur separatists and their supporters used East Turkestan (or "Uyghurstan") as an appellation for the whole of Xinjiang, or for a future independent state in present-day Xinjiang Uyghur Autonomous Region (presumably with Ürümqi as its capital). They reject the name of Xinjiang (meaning "New Frontier" in Chinese) because of the Chinese perspective reflected in the name, and prefer East Turkestan to emphasize connection to other westerly Turkic groups. However, even in nationalist writing, East Turkestan retained its older, more narrow geographical meaning. In China, the term has negative connotations because of its origins in European colonialism and present use by militant groups. The government of China actively discourages its use. East Turkestan is a founding member state of the Unrepresented Nations and Peoples Organization (UNPO), which was formed in 1991. The July 2009 Ürümqi riots were a series of violent riots over several days that broke out on 5 July 2009 in Ürümqi, the capital city of the Xinjiang Uyghur Autonomous Region (XUAR), in northwestern People's Republic of China (PRC). The first day's rioting, which involved at least 1,000 Uyghurs, began as a protest but escalated into violent attacks that mainly targeted Han Chinese people. China's People's Armed Police were deployed, and two days later hundreds of Han people clashed with both police and Uyghurs. PRC officials said that a total of 197 people died, among those killed most of them are Hans, with 1,721 others injured and many vehicles and buildings destroyed; however, Uyghur exile groups say the death toll is higher. Many men disappeared during wide-scale police sweeps in the days following the riots; Human Rights Watch (HRW) documented 43 cases and said figures for real disappearances were likely to be much higher.Rioting began when the police confronted the march calling for a full investigation into the Shaoguan incident, a brawl in southern China several days earlier in which two Uyghurs had been killed. However, observers disagree on what caused the protests to become violent. The PRC central government alleged that the riots themselves were planned from abroad by the World Uyghur Congress (WUC) and its leader Rebiya Kadeer, while Kadeer denies fomenting the violence in her fight for Uyghur "self-determination." Uyghur exile groups claim that the escalation was caused by the police's use of excessive force.Chinese media coverage of the Ürümqi riots was extensive, and was compared favourably to that of the unrest in Tibet in 2008. When the riots began, telephone and internet connections with Xinjiang were cut off. In the weeks that followed, official sources reported that over 1,000 Uyghurs were arrested and detained; Uyghur-run mosques were temporarily closed. The communication limitations and armed police presence remained in place as of January 2010. By November 2009, over 400 individuals faced criminal charges for their actions during the riots. Nine were executed in November 2009, and by February 2010, at least 26 had received death sentences. Karamay is a prefecture-level city in the north of the Xinjiang Uyghur Autonomous Region, People's Republic of China. The name of the city comes from the Uyghur language, and means "black oil", referring to the oil fields near the city. Karamay was the site of one of the worst disasters in modern Chinese history, the 1994 Karamay fire, when 324 people, including 288 school children, lost their lives in a cinema fire on 8 December 1994. The Lanzhou−Xinjiang railway or Lanxin railway (simplified Chinese: 兰新铁路; traditional Chinese: 蘭新鐵路; pinyin: Lánxīn Tiělù) is the longest railway in northwestern China. It runs 1,904 kilometers (1,183 mi) from Lanzhou, Gansu, through the Hexi Corridor, to Ürümqi, in Xinjiang. It was Xinjiang's only rail link with the rest of China until the opening of the Lanzhou–Xinjiang high-speed railway in December 2014. The railway follows the path of the ancient Silk Road. The Soviet invasion of Xinjiang was a military campaign of the Soviet Union in the Chinese northwestern region of Xinjiang in 1934. White Russian forces assisted the Soviet Red Army. Uyghur nationalism, or the East Turkestan independence movement, is the notion that the Uyghurs, a Turkic ethnic group who primarily inhabit China's Xinjiang region (or "East Turkestan"), should form an independent state. Unlike the Han Chinese population, dominant throughout most of China, Uyghurs speak the Uyghur language and are generally Muslim. The history of the region has become highly politicized, with both Chinese and nationalist Uyghur historians frequently overstating the extent of their groups' respective ties to the region. In reality, it has been home to many groups throughout history, with the Uyghurs arriving from Central Asia in the 10th century. By the 20th century they made up the vast majority of the population. In 1933 and 1944 attempts were made to declare an independent republic, but the first of these collapsed and the second was absorbed into People's Republic of China in 1949. Pro-independence groups maintain that this constitutes an illegal occupation.Since then, a state-orchestrated mass migration from the 1950s to the 1970s has brought millions of ethnic Han Chinese into Xinjiang. Many Uyghurs reportedly feel that they are slowly being eradicated as an ethnic and cultural group, and Human Rights Watch describes a "multi-tiered system of surveillance, control, and suppression of religious activity" perpetrated by state authorities. It is estimated that between 500,000 and 2,000,000 Uyghurs are currently held in political and assimilatory re-education camps. China claims such measures are justified as a response to the "terrorist threat posed by extremist separatist groups".These factors have led to ongoing conflict with police and Han Chinese, including both frequent terrorist attacks and wider public unrest (such as the July 2009 Ürümqi riots).There is no single Uyghur agenda, and organisations which support the formation of an independent Uyghur state or greater autonomy include both non-violent groups such as the World Uyghur Congress, led by Rabiya Kadeer, who lives in exile, and active terrorist organisations such as the Turkistan Islamic Party (often referred to as the "East Turkestan Islamic Movement" or ETIM) which often see the Uyghur struggle as part of a larger global jihad. Some groups, such as the East Turkestan Liberation Organization, are labelled as terrorists by China but not others. The Uyghurs (, ; Uyghur: ئۇيغۇرلار‎, уйғурлар; Chinese: 维吾尔, pinyin: Wéiwú'ěr) or Uighurs, are a Turkic people who live in Central and East Asia. As of 2019, Uyghurs live primarily in the Xinjiang Uyghur Autonomous Region of the People’s Republic of China, where they are one of China's fifty-five officially-recognized ethnic minorities. Uyghurs primarily practice Islam.An estimated 80% of Xinjiang's Uyghurs live in the south-western portion of the region, the Tarim Basin. Outside Xinjiang, the largest community of Uyghurs in China is in Taoyuan County, in north-central Hunan. The World Uyghur Congress estimates the Uyghur population outside of China at 1.0–1.6 million. Significant diasporic communities of Uyghurs exist in the Central Asian countries of Kazakhstan, Kyrgyzstan and Uzbekistan and in Turkey. Smaller communities live in Afghanistan, Germany, Belgium, the Netherlands, Norway, Sweden, Russia, Saudi Arabia, Australia, Canada and the United States. The Xinjiang Production and Construction Corps, known as XPCC or Bingtuan ("The Corps") for short, is a unique economic and paramilitary organization in the Xinjiang Uyghur Autonomous Region (XUAR) of China. The XPCC has administrative authority over several medium-sized cities as well as settlements and farms in Xinjiang. It has its own administrative structure, fulfilling governmental functions such as healthcare and education for areas under its jurisdiction. 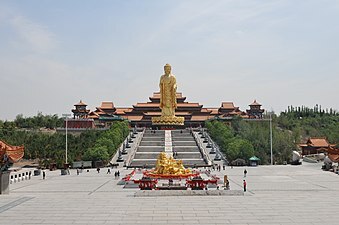 Nominally subject to the XUAR, its internal affairs, including the administration of its cities and reclaimed land, is separate from that of the Autonomous Region and under direct control of the central government.The XPCC was founded by Wang Zhen in 1954 under the orders of Mao Zedong. The stated goals of the XPCC are to develop frontier regions, promote economic development, ensure social stability and ethnic harmony, and consolidate border defense. In its 50-year history, the XPCC has built farms, towns, and cities, and provided land and work for disbanded military units. The XPCC also participates in economic activities, and is known as the China Xinjian Group (中国新建集团). It has a number of publicly traded subsidiaries. The Xinjiang conflict is a conflict in China's far-west province of Xinjiang centred around the Uyghurs, a Turkic minority ethnic group who make up the largest group in the region.Factors such as the massive state-sponsored migration of Han Chinese from the 1950s to the 1970s, government policies promoting Chinese cultural unity and punishing certain expressions of Uyghur identity, and heavy-handed responses to separatist terrorism have contributed to tension between Uyghurs, and state police and Han Chinese. This has taken the form of both frequent terrorist attacks and wider public unrest (such as the July 2009 Ürümqi riots). In recent years, government policy has been marked by mass surveillance, increased arrests, and a system of "re-education camps", estimated to hold hundreds of thousands of Uyghurs and members of other Muslim minority groups. Ürümqi (UK: , US: ; Uyghur pronunciation: [ʏrʏmˈtʃi]; Uyghur: ئۈرۈمچى‎ CTA:Ürümçi; Chinese: 乌鲁木齐; pinyin: Wūlǔmùqí), abbreviated Wushi (Chinese: 乌市; pinyin: Wūshì), formerly known as Tihwa (Chinese: 迪化; pinyin: Díhuà), is the capital of the Xinjiang Uygur Autonomous Region in the far northwest of the People's Republic of China. 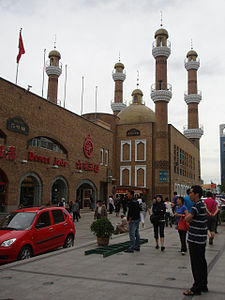 Ürümqi was a major hub on the Silk Road during China's Tang dynasty, and developed its reputation as a leading cultural and commercial center during the Qing dynasty in the 19th century.